There are 7,111 languages still being spoken around the world. However at least a third of those languages are in danger of dying out. 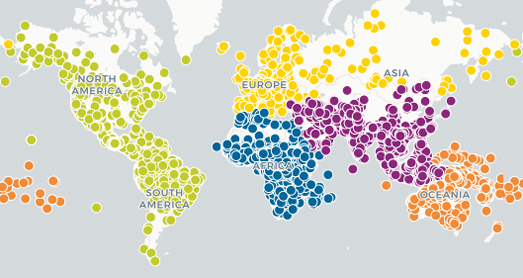 Ethnologue's Living Languages interactive map shows where all 7,111 living languages, as of 2018, are spoken around the world. The language markers on the map are colored by region (with locations assigned to primary countries). Nearly two thirds of the world's languages are from Asia and Africa. These two continents have the densest concentration of different languages. However the vast majority of the world speak a European or Asian language. 18.5% of the world's languages are Pacific languages. However on average only about 1,000 people speak each of those languages, therefore only a very small percentage of the world's population speak one of those Pacific languages. Papua New Guinea is the country with the most different languages. There are 840 different living languages in Papua New Guinea. Indonesia comes next with 710 languages. Nigeria is third with 524 languages. You can learn more about many of the languages on the Living Languages map using the Langscape Map, a map which provides information on around 6,000 languages spoken around the world. You can click anywhere on the Langscape Map to view which languages are spoken at that location. As well as helping you discover which languages are spoken where, the map includes information about demographics, language families and audio recordings & text materials. After clicking on a location on the map you can select any of the listed languages to view information about it beneath the map.